Like a general manager clinging to the “tremendous upside potential” of a draft reach, EA Sports has patiently given the NBA Live series ample time for development since its revival. Three years into this reclamation project, the franchise has slowly and steadily taken strides to shore up its game. But given the sizeable quality gap that still exists between Live and NBA 2K, you wonder if other voices in the organization may say it’s time to cut their losses and move on. NBA Live 16 is not a bad game. Continuing its gradual upward trajectory, this year EA introduces several subtle gameplay tweaks that make it a serviceable experience. Opposing teams feed their star players and punish mismatches. Players react emotionally to big plays. New visual defensive guides make it easier to say in front of your mark, and off-ball movement once again takes a realistic step forward. Continued improvement may be the biggest takeaway with NBA Live 16, but expect to encounter some immersion-shattering faults as well. The lack of varied animations while shooting in the paint causes players to make needlessly difficult attempts, contorting out of good scoring positions and into bad ones. Some fouls are called where no contact occurs in the replay. The ball occasionally warps while dribbling, and one time I saw it stick to the backboard. Gameplay is undeniably king in sports games, but its worth is wasted without good modes to support it. 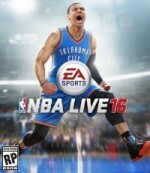 NBA Live 16 falters here the most. The Dynasty mode is largely unchanged from last year, and this bare bones offering suffers from insufficient attention to detail. The broken automated rotations frequently leave 80-plus rated players like Nicolas Batum, Rajan Rondo, and Tony Parker on the bench for A.I.-controlled teams. Restricted free agents inexplicably go unrestricted instead of offering users the conventional team option, and you still can’t re-sign players until the offseason. NBA Live’s Be A Pro-style Rising Star mode also checks the boxes for all the basics, but brings with it the problems from last year. The finicky grading system still has a hard time properly tracking performance, punishing a player for giving up good looks in favor of a teammate with a better look, or for letting his original mark score on defense even though he rotated to cover another player after a screen. With no off-the-court dealings or locker room relationships to manage, it feels woefully underdeveloped. Leaving Dynasty and Rising Star largely untouched, EA put its resources into introducing two new modes in NBA Live 16, Pro-Am and Summer Circuit. These online-centric experiences give you a chance to play competitively and cooperatively in new ways with your created player. Summer Circuit is a fun challenge-based mode that pits a cooperative team team against a series of progressively harder A.I. matchups, with unique player rewards at stake. Pro-Am lets players participate in five-on-five pickup games, which are a mixed bag. You can get into matches quickly and the servers were stable in our experience, but low player populations make it hard to get a full lobby, meaning A.I. players substitute in. Despite a well-intentioned attempt to reward strong team play by EA with a performance grading system, most games I played in were dominated by ball hogs emboldened by how easy it is to score. EA doesn’t provide a post-game report, but I’d guess the team shooting percentages rarely dip below 60 percent. While serviceable, NBA Live 16 never answers its existential dilemma – why is it here? Being a basketball game that works most of the time isn’t enough. Not being up to par with its stellar rival is forgivable, but Live also lacks a point of distinction that justifies its existence to basketball fans. Without that, it ultimately may not earn a contract extension. Not being up to par with its stellar rival is forgivable, but NBA Live 16 also lacks a point of distinction that justifies its existence to basketball fans.